You may have thought September marked the winding down of the gardening season as fall quickly approaches… but you couldn’t be further from the truth! It’s true that the time to plant any summer crops (with the exception of snap beans) has now passed, but for the fall garden, September is prime time! 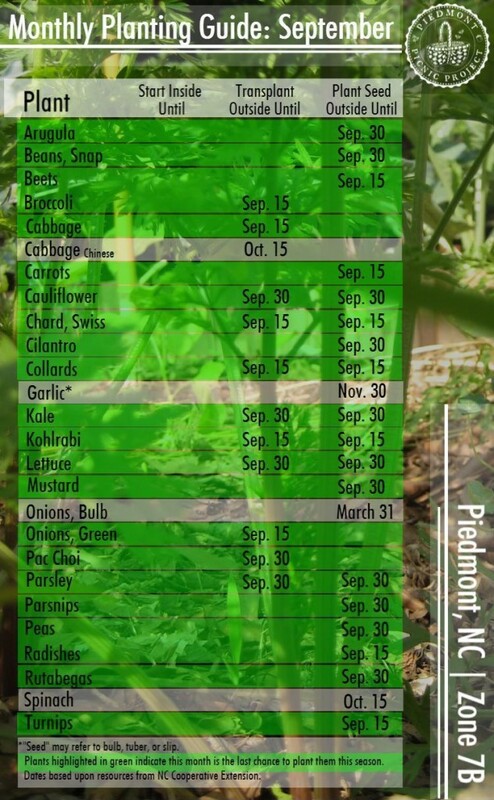 And it’s also your last chance for most fall crops… Note all the green highlighted rows in our guide below. It’s past time to start your fall seedlings indoors, but there is still plenty of time to purchase transplants from your local garden center or direct seed many others. Some plants that we generally think of growing only from transplants can actually be direct-seeded in the fall, such as cauliflower and kohlrabi. Who knew? So take advantage of the milder weather fall brings, and start sneaking in some fall crops between your dwindling summer plants! Don’t forget to give them a good helping of compost or well-aged manure. Your garden will need a little pick-me-up after the toll summer production can take on it.